So opens my first published article in the spring of my senior year of high school. 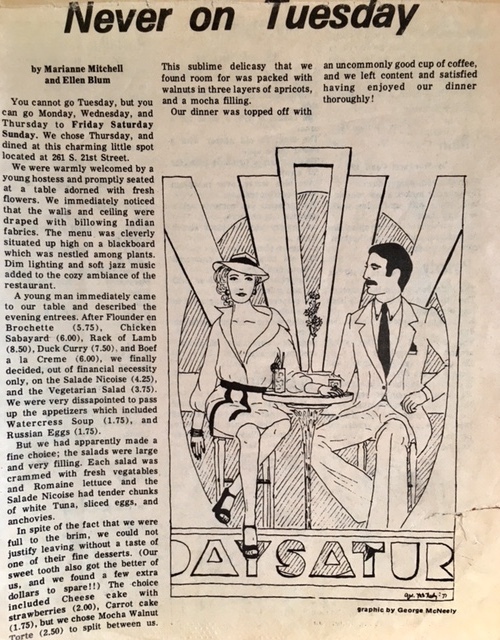 It was a restaurant review in my high school newspaper, The Earthquake, that I co-wrote with my friend Marianne, with whom I am still close. She became a painter and I, a writer but I remember that lead insisting itself on both of us. It’s hilarious to read, now, forty years later. A young hostess? Really? We were 17 or 18 at the time. Coming across these six-paragraphs delights me for three reasons. First, it’s a reminder of how long I have been honing my craft. Second, what a lovely souvenir from my senior year. Finally, though I never wrote another restaurant review in my life, discovering and critiquing new eateries is something that I still love to do with Marianne. We like what we like from an early age. And it appears that we know how to pick ‘em, too. I just Googled the restaurant to see what might be in its place and would you believe, it’s is still there. Just like we are, now. But without this yellowed newsprint, there wouldn’t be proof that I was there, then. I guess what I’m saying is, keep what you can, so you can take note of the miles you travel. 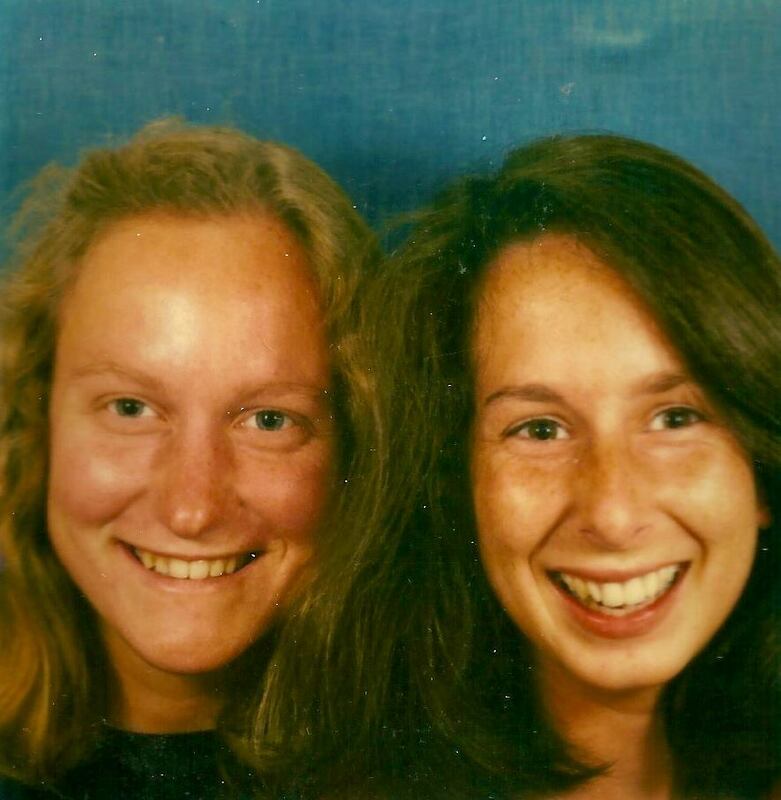 Marianne and I, many miles ago. Cover image is page 5 of The Earthquake, March 11, 1977. 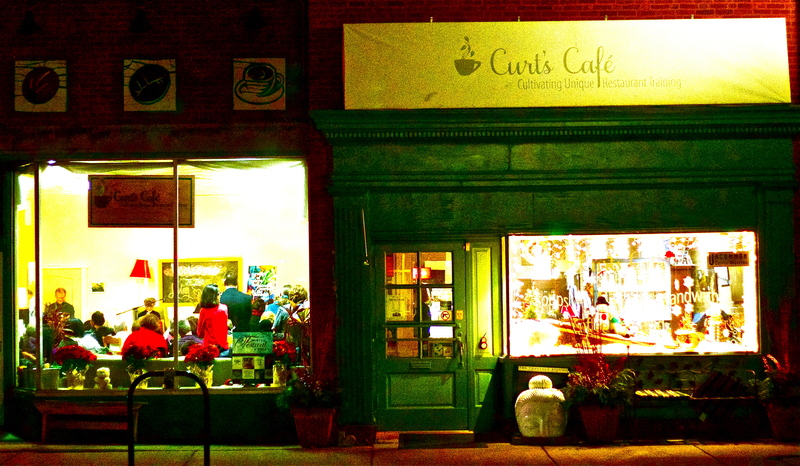 Those who secured an egg salad sandwich or a small plate of veggies and hummus, a chair or section of couch and a spot to see the writers of Thread read their work, know it’s so: Thread: A Literary Publication enjoyed a magnificent launch last Wednesday evening at the cozy Curt’s Cafe. But you who came out, parked and then couldn’t find a place to put yourself, who knew? 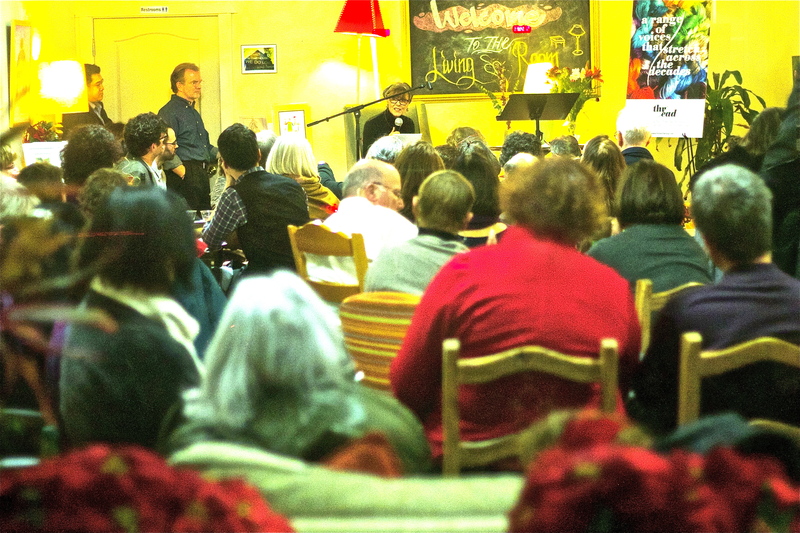 I offer you free admission to the next reading! For you who couldn’t be there, let me set the scene: An overflow crowd of people sat quietly as nine writers read their essays on a variety of subjects from Lee Reilly’s caregiving curiosity about the life of her charge in “Finding Nancy H.,” to the raging hormones of Anne Heaton’s mid-pregnancy in “Crazy Bird” to what it feels like to want to light up a joint in Timothy Parfitt’s “Smoke Screen,” remember something good about one’s not-so-terribly good father in “The Bath,” or be Tom Wolferman in a job, outgrown, in “A Paper Trail.” It was a night of stories reflecting human experiences across the lifespan. 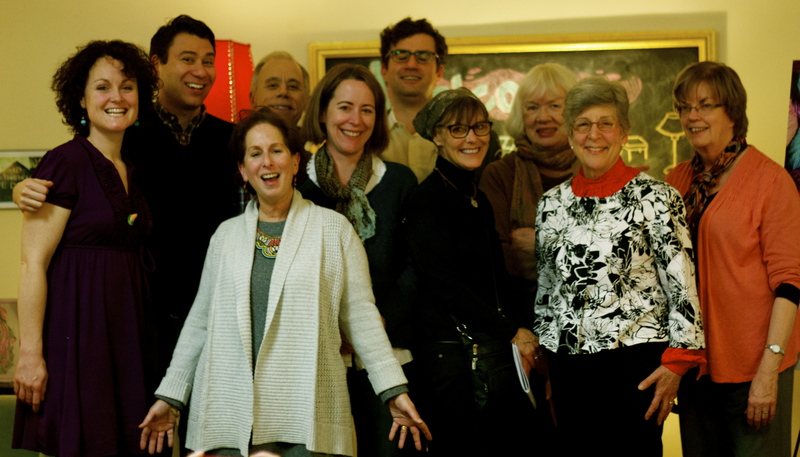 A celebration not only of writers and the premiere issue of Thread but an evening devoted to the truth and beauty of the personal essay. My favorite of all the written forms! 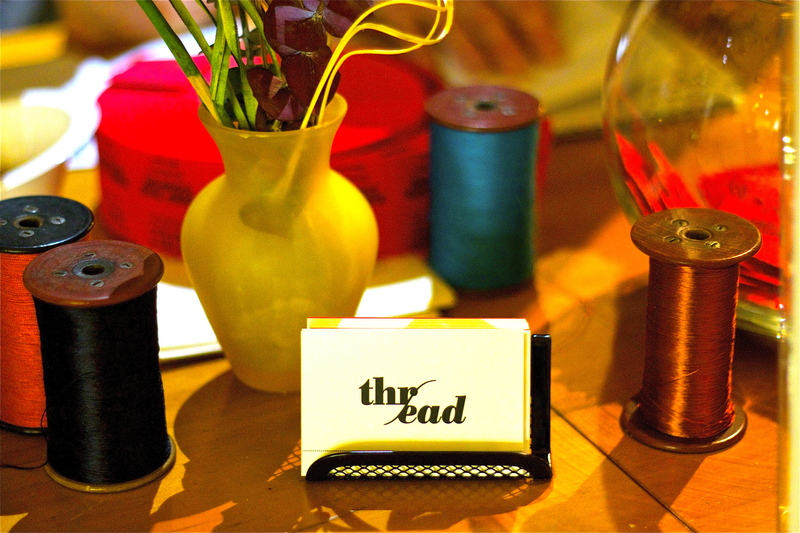 Thread will be hosting three readings a year – the next one in April – to coincide with the release of each new issue. I’m already looking for a larger venue, so stay tuned about that! 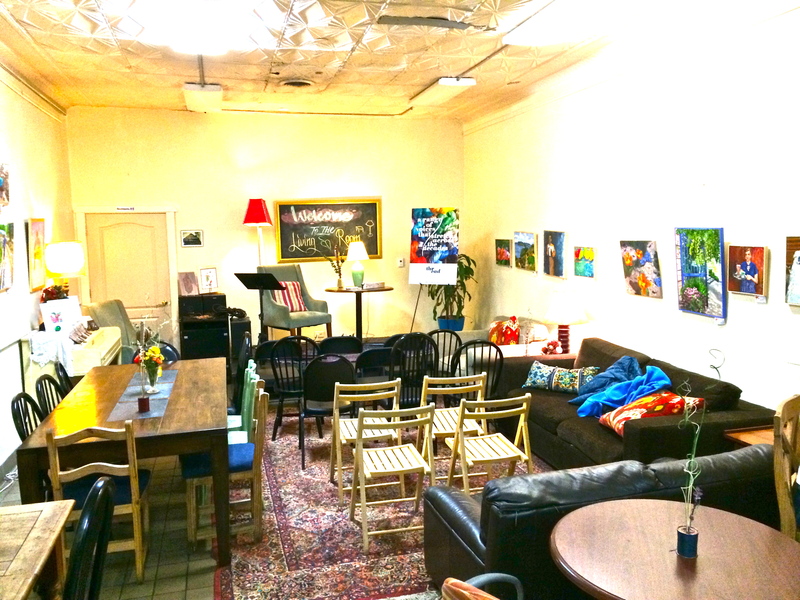 But for those of you who can’t make it for the readings on a Wednesday night, you’ll just have to find a few minutes and a place where you can read from a well-lit screen to soak up these artful word journeys. What I love about personal essays is that they are indeed personal – sometimes painfully so – and yet the best ones touch on something in the reader, something universally human, and it has the potency to not only move us but even, possibly, to change us just a little bit. Take Robert Grubb’s “Imprint.” A connection is made from a grown son to his mother when a memory is evoked by a new puppy who is trying his patience. I’ll be looking for submissions for future issues beginning in mid-January 2015. Go to the Submissions Guidelines page of the Thread site for more about that. And so that you don’t miss reading dates and publication releases and posts about writing and creative process, take a minute to subscribe to this blog and to Thread. My youngest daughter is graduating from college in a few weeks and preparing to move to New York City for her first job. I keep offering to help with neighborhood selection and apartment hunting but she’s been politely waving me off. “I’m good, Mom,” she says. It’s becoming clear that she doesn’t need my help because, the truth is, she knows more about navigating urban space than I do. On the subject of living as a single woman living, working and socializing in the city, I have virtually nothing to offer her. I’ve been sitting with this realization now for some time, mulling over the meaning in the moment when you recognize that your child is now the expert. It’s yet another in a long succession of prompts, brought on by the young. I share this with you — especially for my writing students who are currently on break — as a reminder of how deep that well of story ideas can run from the young ones in our lives. Whether they are our sons, daughters, nieces, nephews, cousins, godchildren, patients, clients or neighbors, there are so many rich prompts that can come from their lifecycle events, big and small. My eldest daughter – also an urban animal – has had many more years of dating experience than I so what, if anything, can I offer in the way of useful advice? Many of my friend’s children are graduating from college and getting their first jobs, which has been bringing up memories of my own. What’s it like to be the child of a traveling musician, a kid who goes on tour with Mom? As the weather is warming, the children in my neighborhood are riding their bicycles which is conjuring up memories of learning how to ride and where we went with that newfound freedom. Photo diving can be very fruitful for memory jogging. I can recall where each of the above photographs were taken, and the mood. The first, in 1997, in our front yard. Mood, goofy. The second, in 2004, at the New Jersey shore. Mood, relaxed. The third taken in 2013, on the deck of a Skokie restaurant for a belated Mother’s Day dinner, just me and my girls. Mood, well fed and happy. I’ve written in one journal or another for 40 years. Here’s a picture of them. You can see my very first one, a paisley print on the far left tucking out from beneath a dark blue leather journal. Fourth from the top. Amazing that before they were colorful, bound or wire-ringed books, they were trees. But last week, with a very full glass of wine that I filled twice, I went through my journals, reading some passages, skimming others. And then, I thanked each one, ripped out the pages, built a fire and fed the pages into it. The fire burned for four hours as it consumed rants, to do lists, plans for the future, vents, wishes, dreams, annoyances, story ideas, rage, gratitude, doubt, praise, doubt, uncertainty, fear, doubt, whining, joy, relief, and more doubt. Me, usually with a pen, working things out. To get to here. I couldn’t let go of them all. I saved both of my pregnancy journals for my daughters. And I couldn’t let go of my first one from 1973. I also kept the covers. I have an art project in mind. But I wanted to remember the burning. So I can remember the mix of emotions I felt as I watched: light, strong and giddy. In the morning, in addition to my memory and the images I’ve shared with you, this is what remained. I’m going to take the ashes and bury them in the earth where they began so another 13-year old girl will have paper on which to practice her writing and work things out. It was a gift slash burden at my high school for graduating seniors to fill a full page of the yearbook with a photograph and a quote. Choosing the right shot and the right words that you could live with — forever — was a big deal. That was pressure, man. My friend Jeremy, who was handy with a camera, took this picture of me in my parent’s backyard, which turned out well. Nice composition and cool lighting. (Thanks, Jeremy!) But I remember being less worried about the photo, I was 18, after all, than I was about the words. The words really mattered to me. Reading them now, these lyrics to the Simon & Garfunkel song, “Bookends,” I see a harbinger of personal mission. I seemed to be aware of how I would feel looking at this page in the future. As though I was leaving myself the message that memory was important. That photographs helped us tap into our memories. Not surprising that I am, and have always been, the keeper of the family photo albums. The one who, at reunions, will stir the memory pot to see what bubbles up. I think we leave little crumbs of memory for ourselves over our lifetime, to go back to. If we are curious.